Listen to Songs of the Dragon! The Temuan are forest people found in the states of Selangor, Pahang and Negri Sembilan. They form one of Peninsular Malaysia’s 18 indigenous aboriginal tribes. They speak Malay as well as their own Temuan language and many still survive by gathering local jungle produce such as durian, petai, bamboo and rotan. Today some of the tribe supplement their meagre jungle income by taking casual work in the nearby town of Kuala Kubu Baru. The Temuan have a great reverence for all hills and mountains and the rivers and streams that flow from them. Their most sacred landmark is Gunung Raja (Royal Mountain) on the borders of Selangor and Pahang. They believe their ancestors, Mamak Bongsu and Inak Bongsu (human manifestations of God), survived the Great Flood by climbing to the top of a gaharu (eaglewood) tree on Gunung Raja. When the waters subsided they descended and seeded the present race of Manusia (humanity). The Temuan believe they were placed on the earth by Tuhan (God) to be guardians of the rainforest and that if they fail in their sacred duty, the whole world will turn upside down and humanity will perish. Each river, hill, stream, rock, tree and shrub is animated by a guardian spirit. Rivers are guarded by dragons (naga) and snakes (ular) which often cause mayhem if their homes are desecrated. The Temuan’s culture reflects their belief in these nature spirits. Their animism takes the form of taboos, herbal remedies, ritual ceremonies and magic. They have dukun (healers) and a village bomoh (shaman) who, when in a trance state, communicates with the nature spirits. It’s the shaman who leads the tribe in the annual sawai - an ancient earth healing ritual to honour their ancestors and appease the guardian spirits. Despite the richness of the Temuan culture very little of it has been documented. Within the tribe there is a high level of illiteracy so their beliefs have been handed down the generations in the form of stories and songs. Their oral tradition began to disintegrate during the Second World War and the subsequent communist insurgence when the Temuan were moved into town settlements. The old ways seemed to have little relevance to the generation born and raised in an urban environment and the storytelling stopped. When the Temuan returned to the jungle in the early 1960s much of their tradition had fallen into disuse and only the more senior members of the tribe still remember the old ways. click here to meet the Temuan! AKAR UMBI '95: Antares, Stanley Nickam, Cheong, Jimmy Boyle Jr, Rafique, Mak Minah, John Hagedorn, Mak Nai. MAK MINAH: Diva of the Malaysian Rainforest who loves meeting people. It started in 1992 when Antares moved to the Pertak Forest Reserve and Rafique Rashid set up his studio in Kuala Kubu Baru. 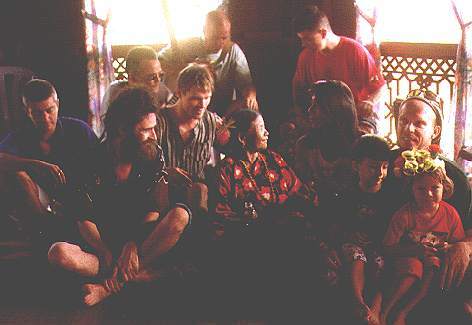 Through this connection other musicians, writers and filmmakers began to get to know the indigenous Temuan community of Kampong Pertak. They realized that the Temuan’s rich oral traditions were in danger of becoming lost in the new money culture. They resolved to document as much of this valuable heritage as possible.The first point of reference was through music. Taking ceremonial singer Minah Angong’s songs as the starting point, they experimented and explored, adding contemporary instrumentation to augment the traditional Orang Asli bamboo percussion. Antares was commissioned in 1993 by Melbourne-based dancer-choreographer Chandrabhanu to produce 30 minutes of music for a freestyle dance piece called Birthplace Reclaimed. Minah’s song Burung Meniyun was incorporated into the piece as a finale and she was invited to perform it live. The effect was mesmerizing, to say the least. The very next year Akar Umbi performed for a 42,000-strong audience at a gigantic benefit concert for Bosnia staged at the Shah Alam Stadium, sharing the limelight with the biggest names in the music business, including M. Nasir, Sharifah Aini, Amy & Search, Sahara Yaakob, and Jamal Abdillah. The concert was telecast live to a nationwide audience on RTM2. Akar Umbi was offered a guest slot at the first Rainforest World Music Festival in Sarawak and wowed the crowd. The following year, Akar Umbi was given its own billing at the festival (which celebrates its 10th phenomenal year in July 2007). Sadly, three weeks after the Sarawak gig, Minah Angong fell ill and unexpectedly passed away on 21 September 1999. 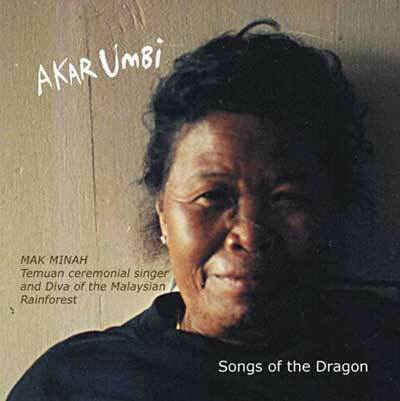 Antares resolved that Minah Angong’s musical legacy be preserved for posterity, and on 9 August 2002, Akar Umbi’s first CD, Songs of the Dragon, was released by Magick River in conjunction with the U.N.’s "International Day of the World's Indigenous People." The album is temporarily out of stock, but plans are afoot to issue a new batch, as well as make the music downloadable. As a band, AKAR UMBI is unique because it not only showcases the Temuan’s sacred songs, but the project has also involved Malaysians from all ethnic backgrounds (Orang Asli, Malay, Chinese, Indian, Eurasian and Caucasian). The music breaks through barriers and Minah Angong has become a cultural ambassador for her people. The favorable response to the music has shown the Orang Asli that other people do value their traditions. 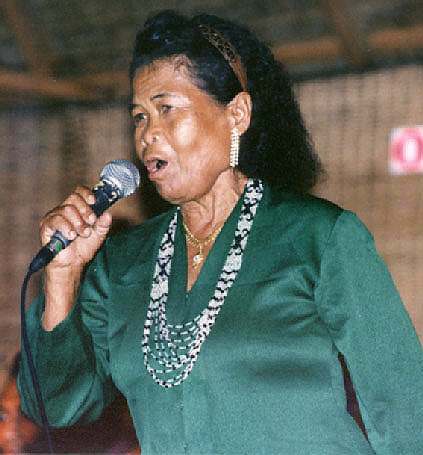 Most gratifying to note, the younger generation of Temuans have begun to learn some of Mak Minah’s healing songs from listening to the Akar Umbi CD. at twilight on 21 September, 1999. (August 28 & 29) where she won over many hearts with her soulful radiance. She was laid to rest atop a hill overlooking Kampung Gerachi, Ulu Selangor. Her gift of song and spirit will forever be cherished by all who had the good fortune to know her. The members of Akar Umbi and Magick River mourn the passing of a very dear friend.